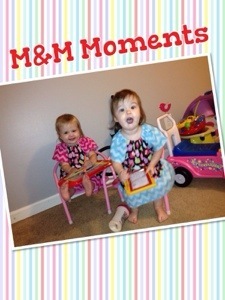 M&M Moments: Can I Sit With You? “Can I sit with you?” It’s phrase I’ve heard hundreds of times in the past few years. I usually hear it at a restaurant near the end of a meal. It’s a request that comes from one if not both of my twin daughters. They love to snuggle and sit in the lap of my wife and I, even though they are quickly growing up. They turned 7 in March. We usually enforce the rule that we have to finish eating before they can sit with us. It’s difficult to eat with one or two seven year olds sitting between you and your food and vying for your attention. But sometimes I break my own rule. They won’t be this little for ever. We have a meal every Wednesday at church before the service, and inevitably, I hear the phrase once again. “Can I sit with you?” It’s usually from Mattie, and she works as hard as she can to get and keep my attention. Her and her sister love their daddy. Why do they do this? They do it because they love their parents so much and they long to be close to us and gain our attention and affection. Yet, we’ve grown up too fast. We’ve moved on from the childlike wonder and awe of our loving Father. We run to and fro and fill our lives with things that, for the most part, don’t matter, when all our Father wants is for us to sit with Him for a while. How long has it been since you sat in your Father’s lap for a while and vied for His attention? How long has it been since you have sat and read His Word and longed to know Him better? How long has it been that you just wanted to spend time with Him just because you love Him so much? One day my girls will grow up and they won’t sit in my lap any more. They’ll move on with their lives, but I hope and pray they’ll always long to sit with their daddy. I try hard to cherish each “Can I sit with you” because I never know when the last one may come. We may grow too old to sit in our earthly father’s lap, but, praise God, we’re never too old to crawl into the lap of our Heavenly Father, lay our head on His chest and spend time with Him. He has promised to return our affection if we will just draw nigh unto Him. He won’t force His love on us. He only grants it when we ask. Seek His love today. They say absence makes the heart grow fonder. I recently found out how true this was on a missions trip to Brazil. It was a trip with the purpose of laying block for a new church building. I was excited and nervous all at the same time. What made it more significant was the fact that I had never flown before. The day to leave quickly approached and I made all the preparations to leave. We were scheduled to meet at the church at four in the morning and I set my clock for three. My alarm went off quickly since packing and nerves kept me up until midnight. My wife instructed me to wake her up where she could tell me goodbye. The hardest part of the trip was not the nine hour flight, or the strenuous labor involved in laying block. 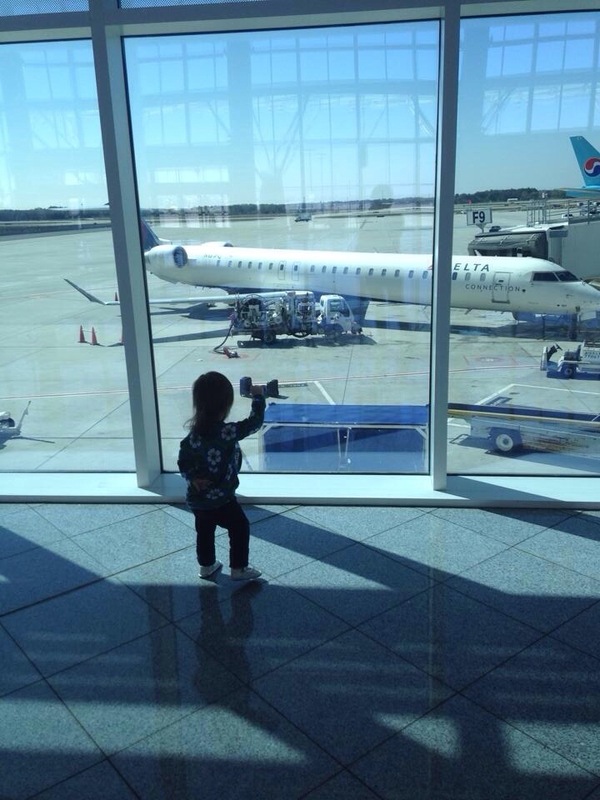 The hardest part was saying goodbye. We embraced each other tightly and the tears began to flow. It was the hardest thing to let go. Then, I stepped into my twin baby girls’ room to see them before I left. They were only seventeen months old and they were sleeping soundly. The tears flowed once more. I said another goodbye to my wife and got into my truck to leave for the church. Upon arriving at the airport in Brazil, I was pleased to learn that they had free wifi. I was able to send my wife a few texts via iMessage before we left for a two hour bus ride. It was nice to make contact with home. There was also wifi at the missionary’s house and I was able to FaceTime my wife and girls with my iPad. The girls loved seeing their daddy’s face. This experience brought to my mind the departure of our Lord Jesus Christ. If I was missing my family and so full of eagerness to see them, I can only imagine the desire Jesus has to be with His children. I was gone for 9 days. Jesus has been gone for 2000 years. And I know that the tremendous love I have for my family pales in comparison to the infinite love Jesus has for us. He must long to be with us more than we can imagine. I know He desires to return soon. We recently bought our twin girls, Mattie and Macie, a set of cheap magna doodles. My wife purchased them at a local store for three dollars. The girls loved them. 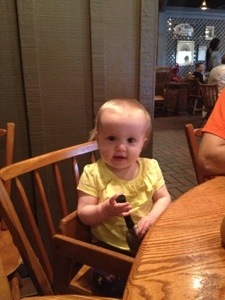 Mattie especially loved hers and she wanted to take it everywhere she went. She held it while she ate, took in the car and she even took it to church. She would cry if we took it away. If you’re not familiar with the magna doodle, it is a drawing board that utilizes magnets to create an image with a special magnetic pen. As you move the pen along the surface of the board, tiny magnetic particles come to the surface to form the image you are drawing. The image can quickly be erased by sliding a plastic handle from one side to the other. Then you have a clean slate on which to draw. The girls loved to sit in my lap and scribble on the magna doodles. I would try to draw silly characters and faces for them, but, before I could finish, they would always scribble on my drawing or move the lever to erase it. They never seemed to let me finish. “And the Lord said unto Moses, Hew thee two tables of stone like unto the first: and I will write upon these tables the words that were in the first tables, which thou brakest. And be ready in the morning, and come up in the morning unto mount Sinai, and present thyself there to me in the top of the mount. And no man shall come up with thee, neither let any man be seen throughout all the mount; neither let the flocks nor herds feed before that mount. The Lord had given the children of Israel the law written by the His own finger on tablets of stone. When Moses came down from mount Sinai to present the law, he was horrified to find Israel worshiping an idol that they had constructed. They had broken the very laws Moses came to give them. Moses threw down the tablets and destroyed them, and God judged His people. Being a God of second chances, The Lord told Moses to chisel out two new stones and bring them up the mountain where God could write the law on them again. Moses went to God with a blank slate. This is a perfect picture of our fallen nature. We come to God with prayers and petitions and He lays His will and way on our hearts, and, before we know it, we’ve broken God’s laws. We want our way and our agenda accomplished and seldom do we sit in the lap of God and receive His instruction. We never let Him finish. 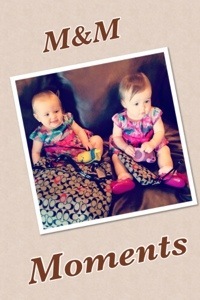 Just like my twin baby girls, we paint a primitive picture of how we want our life to be. We fail to wait and let the Divine Artist finish His masterpiece. We need to come before God with a blank slate. We need to leave behind our selfish wants and ambitions and sit at the feet of the Master and receive His instruction. As we yield the pen, He will paint a picture more beautiful than we can conceive. Let us lay aside our list of petitions and open our ears to the wants and desires of our Heavenly Father. Eventually, the magna doodles broke. The pens lost their tips and the handle didn’t work right anymore, and the girls have moved on to playing with other things, but I’ll never see a magna doodle again without thinking of the lesson of Moses and his blank slate. May we always come before God in this manner. The “trust fall” is a game people like to play where one person crosses his arms and falls backwards trusting in a person behind them to catch them. Mattie and Macie like to play this game as well. Sometimes it’s on purpose and sometimes it’s not. Macie is a pro at the trust fall. She performs this stunt nightly after the girls’ bath. This is the time of the night when they tend to act really silly. Macie gets so excited that she goes limp and falls backwards onto the carpet or onto one of us who is usually sitting in the floor with her. Sometimes Macie falls back and bumps her head against the wall or some other hard object. Then the tears begin to flow. She trusts us and has the faith that we’ll always be there to catch her. There are other times when they fall back unintentionally. An example of this happened the other day at church. We were waiting to do a sound check and we were sitting at the bottom of the platform steps. The girls were walking around, and, of course, they thought it would be fun to climb the steps. Everything was going fine until Mattie fell backwards. I gasped and lunged forward and caught her with one hand just in time to stop her head from hitting the lower step. We were all shaken and Mattie cried. I thank God that I was there to catch her. I am also thankful that God is always there to catch me when I fall. I have total safety and security in His strong arms. There are many ways we can fall in life. We can fall into sin. We can fall in failure of a task that was dear to our heart. We can fall when trials and storms come our way. But we can rest in the fact that, though we fall, God is always there to catch us. He will never let us slip from His grasp. I won’t always be there to catch my girls. I may be away at work or not close enough to catch them. One day they’ll grow up and my hand will be out of reach. But I can trust that God will be there to catch them. He can catch you too. When you fall, just trust in His hand. My favorite day of the week is Saturday. I know as a good Christian that Sunday should be my favorite, but Sundays are very busy for us and leave us exhausted. Saturdays for us are usually our day of rest. I think it’s more how God envisioned the day of rest to be. The modern day church has transformed Sunday into a day of work. With its programs and performances, the church had become a machine. This is not true for the casual churchgoer, but, for those active and involved in ministry, it can be exhausting. This is not the case on Saturday. For us, it’s fun, family, fellowship, and faith. Sunday used to be this way, but, somehow, we’ve lost it. We’ve chosen the part of Martha when we should be with Mary at the feet of Jesus. Last Saturday was one of the best I’ve been blessed with. It’s a perfect example of the point I’m trying to make. I spent the day playing with the twins and working around the house. This work was enjoyable and restful. 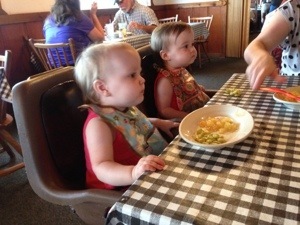 Then, that evening, we drove to Mennonite country for a meal at Yoder’s restaurant. It’s a neat little place in the middle of a wheat field surrounded by views of hay bails and silos. And the food is amazing. Cream corn, fried chicken, and fresh rolls tantalize the tastebuds. Homemade pies of every shape and size tempt even the most strong willed. After when had eaten as much as our stomachs could contain, we took a walk outside the restaurant. Next door is a barn that was converted to a gift shop. Beside the barn is a pet goat the kids can torment and a row of old retired tractors. 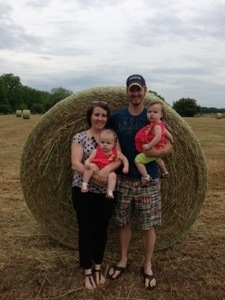 After we played with the goat and sat the girls in the tractor seats, we took pictures with one of many giant bales of hay that sat behind the barn. Then we turned the girls loose in the field. They played as hard as they ever have. The girls have recently started walking, so we usually restrict where they can roam. But in this field, they could toddle as they pleased. It was heart warming to watch. As we drove home with the girls asleep in the back seat, Lauren placed her hand on my leg and mentioned how much fun it all was. It was a great day. It was heaven on earth. God once placed a thought in my heart that never left me. He told me that the family is the closet thing to heaven on earth. Before sin, this is what Adam and Eve experienced. Therefore, the closet thing to heaven on earth is a saved, Godly family spending time together. This gets us as close to Eden as we’ll ever get this side of eternity. That’s what’s so great about camp meetings and dinner on the grounds. It’s about family. I believe a happy, Godly family makes God smile. That’s what church used to be: family. We’ve lost it. I can only pray we’ll get it back. Until then, I’ll settle for Saturdays. Saturday. It’s waking up to a quiet house and spending time in prayer as the girls sleep. It’s listening at the nursery door as the girls wake up and giggle at each other. It’s bacon and biscuits made by my wonderful wife. It’s cleaning the house together with the girls at our feet. It’s taking a walk through our peaceful neighborhood. It’s an evening meal with family and friends. It’s bathtime and the last burst of playtime before bedtime. It’s talking with Lauren before we go to sleep. and the fruit of the womb is his reward. so are children of the youth. It was a typical night at our house. Lauren was busy cooking, and I was emptying the dishwasher or doing whatever I could to help. All the while, the twins were playing under our feet. They love to play in the kitchen. They explore the cabinets where we keep their food and they play with clean dishes in the kitchen floor. 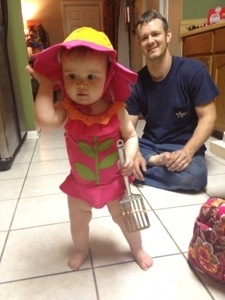 Mattie had discovered the puffs canister and was carrying it around while she toddled through the kitchen. Lauren had gone outside to check on the grill and I had turned away for a second when I heard a thud. Then I heard Mattie crying. I looked down and she was laying on the puff canister crying. Falling is a common occurrence for toddlers, but, this time, she was really upset. I quickly picked her up into my arms to comfort her. Then I noticed something on my hand. It was blood. Mattie had cut the inside of her lip and it was bleeding. Mattie turned out to be alright as it was just a minor cut, but the image of my daughters blood on my hand stuck with me. I didn’t like it. Seeing her hurt, especially bleeding is not something I like very much. I can’t bear the thought of my little girls being hurt. The blood on my hand turned my thoughts to my Savior. Jesus Christ shed all His blood for you and me. And, His Father watched. His Father forsook Him. He allowed the blood of His only Son to be shed. The thought of this is too much for my feeble finite mind to comprehend. I could never fathom allowing my daughters’ blood to be shed for anyone. No matter the cause, I couldn’t allow that to happen. No matter how good and noble the person was that required my child’s blood, I couldn’t allow it. Yet, God shed the blood of His Son for us who are the opposite of good and noble. We are full of corruption and sin. Oh, the love of our precious God for us. To sacrifice His Son for us. What love this is. I’ve learned a lot since becoming a father, but the one thing that has become crystal clear is the love of God. How could I ever doubt Him or the lot I’m given if He first gave me His Son. What a thought. 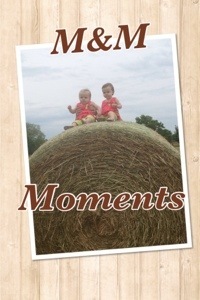 M&M Moments is a new segment that I’m starting in my blog to chronicle our various adventures with our twin girls Mattie and Macie. They have just turned a year old and they are surprising us daily with new tricks. 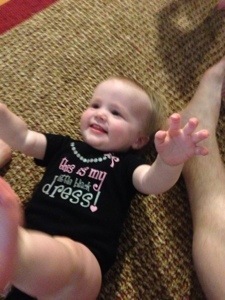 The latest accomplishment was Macie taking her first steps. Mattie has been walking for a while now, but Macie hadn’t tried too much. She was always too busy playing to worry about walking. Crawling worked just fine for her. We have been helping Macie walk by holding her hands while she takes a few steps. She would get so excited, but she was too nervous to venture out on her own. 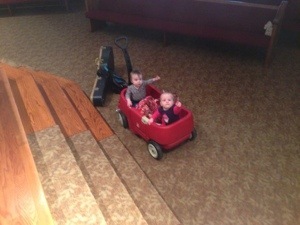 Then, all of a sudden, she started taking a few steps, and, this past Sunday at church, she walked in the lobby. I was so proud of her. Macie still hasn’t quite perfected the art of walking, but she’s working on it. Raising children constantly reminds me of my relationship with my Heavenly Father. Just as I work with my sweet girls in basic things like walking and talking, God is working with me to teach me how to grow as His child. I was so proud of Macie walking, and I can imagine God being proud of us when we finally grasp some spiritual lesson that He was trying to teach us. Sometimes we think we are pretty good the way we are, but God is always trying to lead us closer to perfection. Macie was perfectly content crawling from one place to another, but she didn’t know the possibilities that walking would open up to her. We hold on to our opinions and methods, but God has a better way. God desires the best for us and He just might be leading you to a better Christian walk. We just need to let go and trust Him. 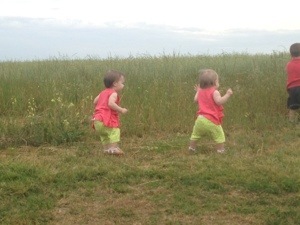 Walking seems such a simple task, but it’s a huge accomplishment for a one year old. With time Macie will perfect her walk. She’ll progress from toddling behind us to running and skipping in the back yard. Her walk will carry her to school, to her first job, and on to college. One day her walk will lead her down the aisle to meet her groom. One day our walk in this life will end and we will begin a new walk as we stroll down the aisles of Heaven with our bridegroom Jesus. Along the way, He’ll perfect our walk day by day.